We often have a Pepsi or a Coke when we have lunch, hang out with friends, or even just simply when watching the television. Sometimes we go in for the taste, sometimes for the sheer pleasure of gulping it down, and may be even due to its popularity. Though many are not choosy, some prefer to have only one out of the drinks mostly. The first way to distinguish between a can of coke and Pepsi is the brand color. Cokes come in red cans, while Pepsi comes in blue cans. Though the drink has the same color, the branding is always in the specified red and blue colors. The tastes of both the drinks are distinct and it is easy to make out the difference. Pepsi is a little more sweet in taste than the coke. This is due to the addition of the artificial sweeteners to it. You will be able to make it right when you take a sip of the drink. The additions of the sweeteners leave a mild chemical taste after you drink it. Compared to Pepsi, coke does not have that chemical after taste owing to the less artificial sweeteners added. 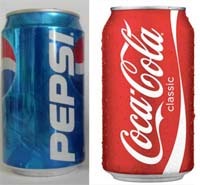 When you drink coke you feel more of that cola flavor in it, while with Pepsi, you get a fruity or fluid sort of taste. The carbonation levels of both the drinks also are different. It is higher in coke. So when you take the first sip of the coke, you get that fizzy effect. This frizz is less in Pepsi. The fizzy nature can be identified by the bubbles formed when you first open the bottle or just simply shake. It is more in the coke. And you do get that bubbly taste down your throat with a Pepsi. Coke is smoother. The bubbles disappear quickly as the fizz escapes from the coke. The basic ingredients of Pepsi are carbonated water, sugar, fructose corn syrup, caffeine, colorings, citric acid, and other natural flavors. When the coke was launched, its main ingredients were caffeine and a small amount of cocaine. The other ingredients, like the Pepsi are carbonated water, sugar, phosphoric acid, and other natural flavorings. When it comes to the branding part, the logo of coke has not varied much since its inception. May be a minor change in the font is all what changed. This has helped it to stay on in the minds of people. But Pepsi, on the other hand, has come up with various logos and slogans. This kept on changing almost yearly. Though the company and market analysts claim that this is in tune with the changing trends in the society, many do not accept this. Each time they see a new logo, they are afraid to try it thinking that the whole drink has changed. 1.Pepsi uses blue color for branding and Coke uses red. 2.Pepsi is sweeter than coke. 3.The carbonization level is higher in Coke than Pepsi. 4.The branding techniques are used more by Pepsi Company than the Coke. Manisha Kumar. "Difference Between Coke and Pepsi." DifferenceBetween.net. October 12, 2009 < http://www.differencebetween.net/object/difference-between-coke-and-pepsi/ >. this is the most biased article that has ever existed, if there were a rating system i’d give it minus infinity. i agree, biased as hell, pepsi is WAY smoother, when i drink coke, i always burp up pure fizz and its annoying. Coke seems more ‘chemical’ to me, when I drink it. Not sure about the artificial sweeteners, I’ve not looked at the labels, and don’t have a non-diet Pepsi around right now. Pepsi tends to taste “cleaner” to me, less thick, goes down more smooth. As for branding. It seems to me Coke has the strongest branding, their branding has always been rather strong, and it’s stuck with people. Pepsi always varies and changes, never quite finding something that has a good hold. Coca Cola is a much better product.It has more cola taste,less sugar,and more carbonation.Coca Cola is more traditional,staying virtually the same except their clever New Coke change in the 1980s,make us real cola lovers urning for the original flavor,although it really wasn’t.Corn sugar instead of sugar and no cocaine.The younger people like Pepsi Cola better because it has 10 more calories in each can and way less carbonation.Have a Coke and a smile or a Pepsi and some cartoons. Pepsi doesn’t use artificial sweeteners. Only in diet drinks. Thought key difference was in the “citric acid” as in what citric? What I heard was Pepsi has slight lemon flavor and Coke has lime. I’m bigger fan of Pepsi! I totally agree with you dude, it’s not biased at all. In fact, this website really helped me with my sciencfair project. Are you joking? This post, while useful in providing an opinion and some information, is definitely biased. It talks extensively of how Pepsi is bad, but fails to list any of Coke’s faults. For example, the thing about aftertaste is quite untrue. Both leave after-tastes. Pepsi gives a semi-sweet one while Coke gives one that seems more metallic DUE TO its lesser amount of sweetener. Also, you should take in the fact that whether it helped you with your science fair project or not does not determine whether this post is biased or not. It is, by the way. Also to talk of the branding. Please keep in mind that the way these two corporations target markets is vastly different. Coke tries to promote its “classic” image, while Pepsi appeals to the younger generation, and its changing logo does appeal to kids and teens. For that matter, it hasn’t changed for a while, and I for one like its current logo. If we’re talking about changes, kids and teens (Pepsi’s target market as it seems) adapt to it well. Take Facebook for example, it changes very often, and people may protest the change for a brief period, but they still use it, and Facebook is still thriving. Please learn the difference between biases and “telling it how it is” before adding your own biases and saying that this was the latter. that was a really good comment post thingie. 1 you have no idea what your talking about and if you read this it does not give you the rite to be rude. if it helped her w/ her science fair good for her but it is none of your bussiness ! As for Pepsi and Coke carbonation levels: Do you know the PSI pressure of each? You didn’t mention that the key difference is that Pepsi has lemon undertones, and Coke has orange undertones. “When Coke was first launched, it’s main ingredients were caffeine and a small amount of cocaine?” Oh, really? Main ingredients? Not water, CO2 and cane sugar? “Branding techniques are used more by Pepsi than Coke?” What a goofy statement. Are the other articles on this site as badly written and off target? I must say, I prefer Pepsi, but that is only because from drinking Coca-Cola, I have found it gives me slight stomach problems. I must comment that your last point is slightly incorrect. Yes, Pepsi has changed their logo slightly over the years, but that is mostly because of how things change over time. They did not want their look to look like Coca-Cola’s look, as it originally did, and then they modified their symbol over time to change from the old glass bottles to the newer cans and plastic bottles. When Pepsi changed to their most recent logo, I must say that I was not afraid to taste their drink again, but instead I was excited that it looked better. As far as the slogans go, here is a list of Pepsi’s slogans: , and here is a list of Coca-Cola’s slogans: . Please take this information into consideration, and I hope you also conclude that they are equal. I totally agree and this helped me with my science fair project a lot. pepsi cola does not mention their product expiry date on their bottles they sold.. I originally preferred coke, but I found it far too inconsistent in it’s taste (from both cans and bottles). I ended up buying a 6 pack of Pepsi because they had no coke left, I’ve not looked back since. Pepsi not only seems to stay fizzy longer, it tastes much nicer, and finally, it always tastes the same! I think both have a good coca cola taste. Pepsi is a little sweeter, but not in a bad way at all. The one thing that makes me despise Pepsi is that the “fizz” fizzles out way way way quicker then Coke. I do not guzzle soda, so i find if i do not drink the whole bottle within 1 hour, i wind up with the flatest soda ever. Coke stays fizzy for hours. While I am no fan of either of these companies or their dodgy trade practices, I do at times enjoy their products, & I have to add to this article that I have never ever heard of either Coke or Pepsi containing artificial sweeteners. Where are you sourcing this information from? The ingredient lists for both products are clearly listed on them, and contain no mention of artificial sweeteners. This would appear to be quite wrong. I agree that Pepsi has a sweeter taste and Coke is a little crisper and fizzier. I think Pepsi tastes better on ice and Coke is better mixed with a cocktail like rum. I don’t agree with you when you say that Pepsi does more branding then Coke. I actually think Coke does more, but they target different market groups. Coke is the go-to drink for most people when ordering in a restaurant or bar. Ever heard anyone order a Jack and Pepsi? It’s always like a rum and Coke. I’ve always preferred Coke to Pepsi, but it’s not like I HATE Pepsi. I will drink Pepsi without complaint, when it’s available. If I were on death row facing the needle tomorrow, one of my requests would be a 12 pack of Coke, chilled ice cold. Pepsi is good, but Coke – at its best – is like heaven. That brings me to a point mentioned by nameless, however. Coke does have consistency issues. There is nothing so infuriating as picking up a 12 pack of Coke that tastes like weed killer, and that happens every so often. I have never had a Pepsi that didn’t taste like the last Pepsi I had, and the Pepsi before that. IMHO, Coke tastes better and is the best soda of all, BUT Pepsi gets points for its consistency. I honestly can’t tell the difference, don’t drink that much soda any how. I prefer Pepsi. Pepsi has a slightly sweeter and cleaner taste. Coke on the other hand has a weird aftertaste. Also, this article seemed biased – the person writing it claims Pepsi adds artificial sweeteners to make it sweeter and passes that off as fact without offering any proof of this claim. The person also claims Pepsi has a chemical aftertaste which I have never heard anyone say before, Coke has an aftertaste, Pepsi does not. I only drink Coke as Pepsi tends to cause sensitivity to light on my skin. I really chuckled at this article though and how badly it was written and even more hysterical was how I kept reading about the help this was for the science fair. I am still forcing myself to stop laughing about the science fair help.